I’ve used a simple acronym framework to explain SEO in all of my jobs. Meta tags; Page title, FB OG tags etc. Over time, I identified the need for additional frameworks to explain certain parts of the LUMPS framework. Especially when it comes to content, the question is, what kind of content are you putting on your site, and how is this contribution to the overall experience people have with your brand and impacts your trust & authority online. While working at Airbnb, the company was conducting specific studies to showcase the economic impact the platform has in certain cities. These reports were printed and circulated among policy makers in these cities. I took the approach to bring these reports online, since it is valuable data and tells an appealing story. It builds trust in the platform and the brand, which could lead to trial of the product by consumers who previously might not have heard of Airbnb, or resented the idea to stay in somebodies home. This is where I started to think along the lines of the WPP brand pyramid, where you need a certain presence in the market to have people even consider you for trial. The more you build loyal customers, the more people more up on the pyramid. As customers move up the brand pyramid, they become more loyal to the brands products, up to the point their ambassadorship even impacts their consideration set of products. Share off wallet goes up, where the brand will capture more of the consumers shopping. The content-brand pyramid is a simplified framework modeled after the WPP brand pyramid, which helps you to understand how brands can build loyal customers, up to the point the customer becomes the ambassador for the brand. This can take extreme forms, where there are people so passionate about a brand, they don’t even consider a product from a different brand. Don’t believe this happens, just look around how many people are using Apple laptops here, combined with iPhones. As the consumer moves up on the pyramid, the share of wallet for the brand increases. 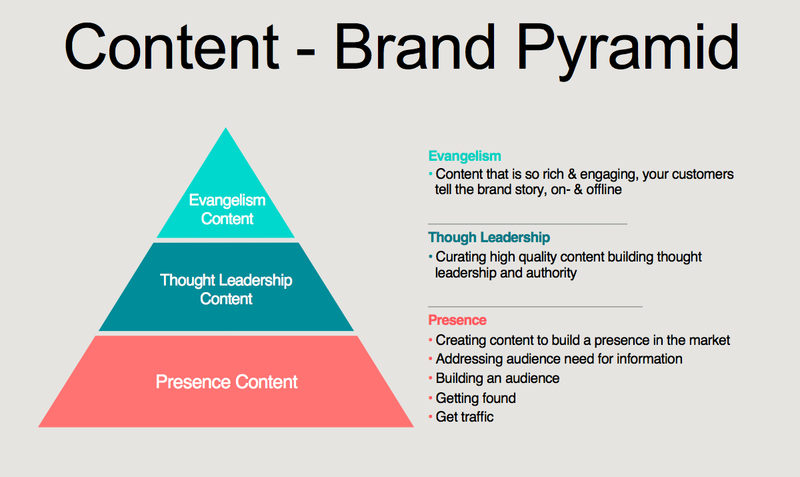 The Content-brand pyramid can help the thinking how and what content needs to be developed across the different stages of building the awareness of the brand. A brand would need to produce a certain amount of basic presence content, to be findable online, in the search engines. As a new or lesser known brand, it would be hard to get out of the gate with EPIC content, as nobody in the marketplace would have had experience with the product or the brand. The message wouldn’t stick. Building up the brand pyramid through exposure of the different layers of the content pyramid would enable the brand to tell a consistent story, while having people engage with the brand content in different layers. The content-brand pyramid can help build the brand pyramid faster by producing content which helps to build customer consideration & loyalty. Similar to this, when people engage with your content, do you really add value to their lives? The layers of the pyramid represent different pieces of content, frequency and objectives. EPIC content, the top, you might only produce one piece each 6 months, where the foundation layer, made up of Presence content, could be one piece every day, or a couple a week.